If ever a fish has given spirit to the imagination, amazed its beholders, thrilled its audience, and surpassed all other fishes in popularity, it is the Siamese fighting fish, Betta splendens. There is little doubt that todays wide fascination with the fishkeeping hobby has been added and advanced by this most unique of tropical fishes. The betta can live comfortably in only enough water to cover it. The bettas brother is apparently his worst enemy. His colors are those of the rainbow. He builds a nest to harbor his offspring and gives them vigilant care. And yet, the comparison with other species, the bettas needs are little, his resistance to illness great. In fact, everything about him is pleasantly gratifying. Bettas also are known to inhabit the shallow rice patties in Asia. These rice patties are very shallow, muddy waters, not our ideal habitat for a fish. This is where their hardiness resulted from. They use a special organ called the labyrinth to enable them to breathe oxygen straight from the surface of the water. If they did not have this ability, they would not be able to survive in their natural habitat due to the low oxygen levels. This aspect of their lives also makes it easier for modern bettas to survive in those little cups that you see in pet store. If you haven't noticed, many pet stores find it unnecessary to clean the bettas water. It is easy to imagine that the water in those cups would lose it's oxygen content very quickly with a gill-breathing fish. Since the bettas breathe from the surface, this allows them to survive these conditions. The conditions they are forced to survive in are still unhealthy and I hope that someday pet store owners will realize this. 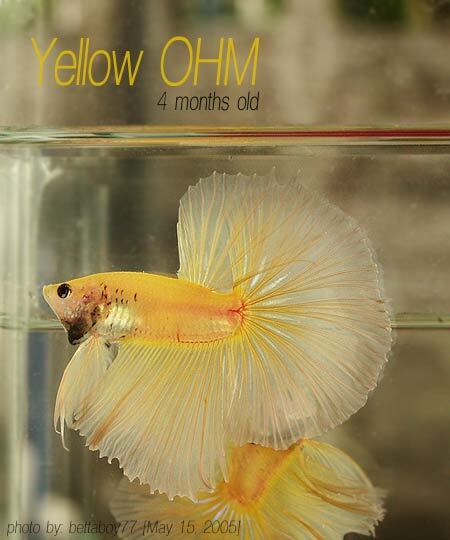 Bettas were originally discovered in Siam. This is where the term 'Siamese Fighting Fish' came from. The males, as well as females, are very aggressive and territorial fish. If you put a male in another males eyesight, it will result in a display of fins and color to intimidate the other male. The bettas used in Siam to fight were, again, not like our Betta Splendens of today. We now only breed to share their beauty with the world.